Electronics - "Forknife 2" - SRV-1 Based Robot Controlled Remotely via Android G1 Phone. After having the pleasant experience of being picked up by Engadget (which seems to fuel a ton of other blogs!) I have been contacted by a few folks who were interested in doing similar things with robotics or other G1/hardware interaction setups. One of these folks who I was very excited to hear from was Howard from the Surveyor Corporation. The Surveyor Corporation which I had known about for a while now sells a powerful embedded blackfin robot controller called the SRV-1. This unit can be setup to have both an onboard camera and wifi chipset which can be used to stream video to a computer and to remotely control a robot. To make this thing even cooler, the hardware and software is open source! Howard (who judging by his around the clock responses is very enthusiastic about his job) thought it would be useful (and lets face it, cool) to control the SRV-1 using the G1 over wifi. We set to work not long after that to make this possible with the open source application SRV1Console... Go take a look! Our first priority in getting this project started was to get video streaming working roughly. This took a weekend to do and once it was down we quickly started adding more features such as the ability to drive the robots around using the tilt sensors in the G1. We also used the trackball and a few on-screen sensors to enable the control of servos. There are still tons of things I want to add to this application (and fix! ), but before I do that I wanted to demo what is possible now. So without further delay, I present Forknife 2. The far more powerful, longer lasting robot, video streaming robot with cutlery that actually does something... All controllable via a G1 phone. Did I mention it has lasers too? Sharks beware. Please take a look at the Images and Video tabs for media on these robots. The Technical tab has the information you need to know to make your own robots. Take a look at the Surveyor Corporations website too! They are controlling a blimp with the G1! Their neural net project is interesting as well. 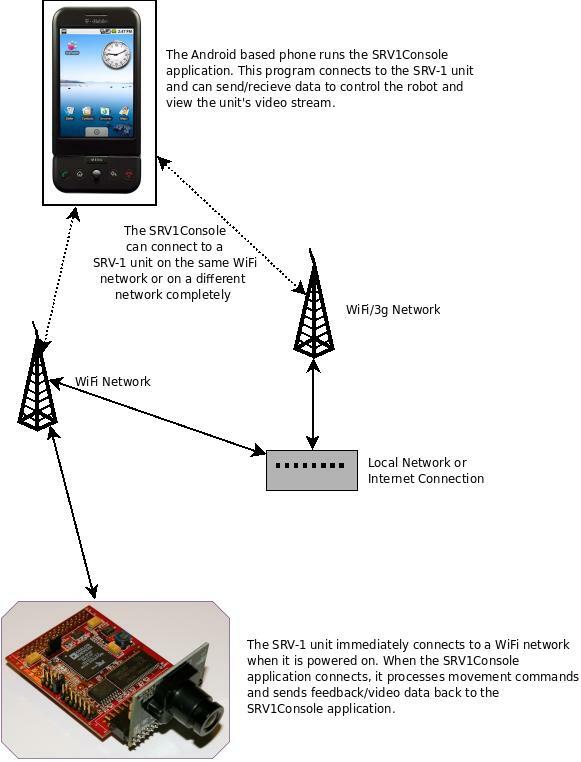 Can this Android Phone directly connect to the SRV-1 unit WITHOUT a router or other device in between ? I find most SRV-1 mobile phone application must use a router and it seem meaningless to control my phone to this SRV-1 Tank when I am playing it in the counterside or my garden. (except when I play it through the internet, but this is not my need)!